Earlier this year, we showed you a concept car at the Geneva auto show called the Volkswagen I.D. VIZZION, one among an entire family of upcoming electric vehicles. Well, one of these cars has evolved into an actual driving machine, and it’s coming a lot faster than you can imagine. As we’re writing this, the I.D. 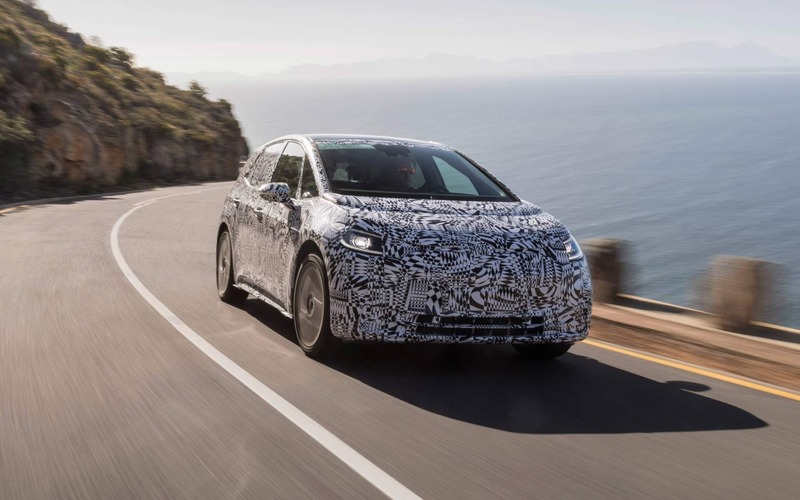 is still at the development stage, but according to the Twitter account of Volkswagen board member Jürgen Stackmann, this mysterious battery-powered car could get up to 550 km of range. Also: Volkswagen I.D. VIZZION Concept: The Family’s Growing! Also: Volkswagen I.D. VIZZION Concept: It’s Serious Stuff! In his post, Stackmann says the I.D. will not only be a zero-emissions vehicle, but will sell for the same price as a “Volkswagen Golf diesel.” Of course, he’s talking about the European market. Diesel-powered Volkswagens aren’t available in North America anymore, and we know why. But if his claims are true, we could expect an all-electric car with a range higher than the most expensive Teslas for under $30,000. That’s indeed very appealing. There still aren’t many images of the car itself, except the camouflaged one you see here. And we still don’t know anything about its specifications, but from what we do know, the I.D. would not be much larger than a Golf, with a large hatchback shape, similar to all the crossovers and SUVs currently driving on our roads. Volkswagen has been clear about its plan to electrify its future by stating that its next generation of gasoline engines would be its last. The carmaker also aims at investing in a charging station network here in North America, similar to Tesla’s Supercharger network. As for this I.D., Volkswagen says it’ll begin taking orders for the thing as of next spring, with production beginning sometime at the end of 2019. At that point, the EV landscape will have changed a lot, but the I.D. should indeed still be very relevant. At least, that’s what Volkswagen hopes. Geneva Volkswagen I.D. VIZZION Concept: The Family’s Growing! Geneva Volkswagen I.D. VIZZION Concept: It’s Serious Stuff! A few weeks ago, we presented a preview of the Volkswagen I.D. VIZZION concept, a fully electric and autonomous car which will be entirely deprived of a steering wheel. As a concept, the idea was original, but it was hard to take this thing seriously, especially as a viable solution.